In addition to the numerous inspiring cases shared at the Summit, there were also a number of substantive issues lively debated across some sessions. One of these was precisely the issue of how to define a social enterprise. Although it was generally acknowledged that there was no commonly accepted definition of social enterprise in Hong Kong or in other parts of the world, the issue continued to be a contentious one. As the practitioners know well, this is hardly an academic question; people’s understanding and perception of the subject could influence the operation and development of social enterprises, positively or negatively. It was interesting and significant to note that this matter was raised by the keynote speaker from China, Mr. Yong-gang Xu, Vice-Chairman and General Secretary of Narada Foundation, one of the largest and most prestigious foundations in China supporting NGOs and social enterprise development. Mr. Xu challenged the currently held view in China that social enterprises should not be profit-making and should not allow dividends to be distributed to shareholders. He was of the opinion that social enterprise’s foremost duty was to fulfill its social mission but at the same time it should be allowed to generate and distribute profits. He arrived at these conclusions not by armchair theorizing but through the long and torturous journey observing and supporting NGOs and social enterprises in action. unexpected challenge: should she transform her organization into an NPO or social enterprise? According to the prevailing conception at that time, a social enterprise was not expected to earn and distribute profits. But her business was already highly profitable. So apparently, this option was out. What about becoming an NPO? Apart from the thorny registration issue, there was a major business dilemma: as an NPO, people would expect the organization to be providing subsidized service and would not be willing to pay for it or at least not at a rate anything close to the ‘market’. This would render the business unsustainable and would require subsidies or grants from government or foundations in order to survive. But her business had never had to rely on funding of this sort in the past. Thus, turning it into an NPO would simply kill the business. Fortunately this young lady sought the advice of Mr. Xu on this matter. Mr. Xu asked a simple question: “Is the current business fulfilling a social mission and financially self-sustaining at the same time? If yes, just carry on with the present mode; there is no need to change”. Mr Xu used this example to illustrate the confusions surrounding the understanding of social enterprises. His advice was simple and pragmatic: Just do what you think is right, don’t bother about what people call you. In this case, what this young lady had created was precisely a social enterprise as most people in other parts of the world would have called it; but her identity inside China was far from unambiguous. As it turned out, this young lady had accepted Mr. Xu’s advice and she happened to be at the Summit as well. She was Ms Fang Zhang, founder and Principal of Wu Qi Career Training School in Xiamen, China. She was also a speaker at the Summit. (Ms Zhang was featured as one of the ten leading social entrepreneurs in China in the book A New Horizon: Stories of 10 Chinese Social Entrepreneurs edited by Li Fan and K K Tse, 2010). Is there a commonly accepted definition of social enterprise in Hong Kong? We would have thought there is one. But unfortunately there isn’t. That is why in every of the three meetings of the newly government-appointed Social Enterprise Advisory Committee (of which I am a member) chaired by the Secretary for Home Affairs, this issue had been raised and debated. Up to this moment no consensus has been reached, to the frustration of many of the unofficial members. There is no universal definition of social enterprise (SE). In general, an SE is a business to achieve specific social objectives. Its profits will be principally reinvested in the business for the social objectives that it pursues, rather than distributed to its shareholders. Is this definition good enough? Yes and No. Yes, in the sense that this is by far the most commonly accepted definition in the UK and some English speaking countries. And since it is pointless to search for the ’perfect’ definition, this might be adequate as a working definition. But there is also a big NO and this has to do with how the government has been interpreting this definition and devising policies affecting social enterprises. First of all, in the two major government funding schemes providing grants (not loan or equity) to social enterprises, the applicant must be a charitable organization. That is to say, if you are an individual setting up a social enterprise, you would not be eligible to apply. Second, it has to do with the profit element. In the above definition, it is stated that ‘its profits will be principally reinvested in the business…’ The key word is ‘principally’, which should mean ‘mostly’, ‘mainly’, ‘almost entirely’, etc, but not ‘exclusively’. This is because in the UK and many parts of the world, social enterprises are allowed to distribute a small part of the profits to the shareholders either to use as the income for the founder/owner or serve as a modest return for the investors. This is practically desirable and morally justifiable. In the UK, the closest legal entity to a social enterprise is Community Interest Company (CIC) which explicitly allows distributing no more than 35% of its profits to the shareholders. 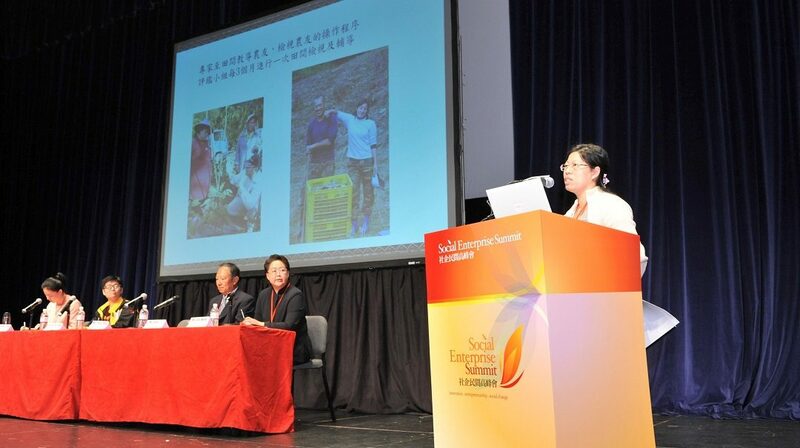 But in the HK government’s perception, social enterprises are not supposed to distribute any profit to the shareholders. To be fair to the government, it must be pointed out that for the government-funded social enterprises, its position is appropriate as they are operated under public funding and no shareholders are involved. But the government has given the public the impression that no social enterprise should be allowed to distribute its profits regardless of the sources of funding. I must repeat that this is not an academic question. A case in point is Gingko House, the restaurants set up by two social workers specifically to provide employment for senior citizens. It is a social enterprise in every sense of the term. But three years ago, when I first interviewed its founder Mr. Roger Lai (who was also a speaker at this year’s Summit), he was reluctant to admit that it was a social enterprise precisely because he thought that ‘social enterprise’ had been perceived as 1) some form of charity, 2) could survive only with government grants, and 3) would not be able to turn in profits. But Gingko House has never received government funding support, was funded entirely by private investment, has been profitable from the second year of its operation, has grown into a chain of three restaurants within three years, has started an organic farm to supply organic vegetables to its restaurants, and has become a role model of social enterprise development in Hong Kong. We need more successful cases like this. So let’s get on with our work. What Is a Social Enterprise in the Hong Kong Context?